The illusion is vaporized. 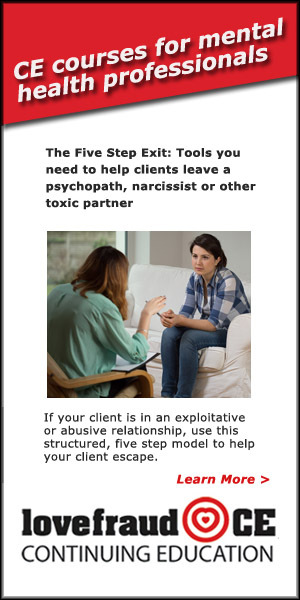 One way or another, you have discovered that your partner, family member, friend or colleague is a sociopath. Maybe you unearthed one lie too many. Or maybe the mask slipped and the person unceremoniously dumped you. However it happened, you’ve learned that he or she has been lying to you all along. You want to know the truth. You want to know where the sociopath really was, who the sociopath was really with, what happened to the money. 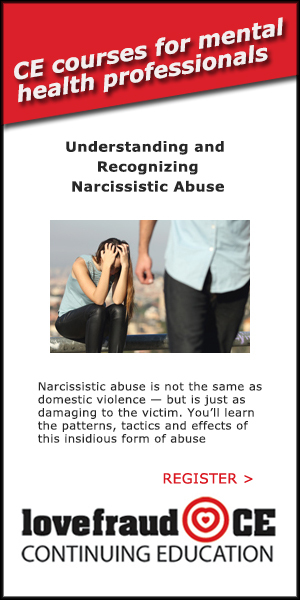 With your new awareness of his or her lying personality, you recall multiple incidents that left you scratching your head, and now look at them in an entirely different light, trying to figure out what was really going on. The sociopath is all you think about, morning, noon and night. You keep replaying incidents in your mind. You go back over old text messages and emails. You stalk the sociopath’s Facebook, Twitter or other social media. You’re desperate for answers. And you wonder what’s wrong with you. First of all, after you’ve tangled with a sociopath, obsession is a normal part of the recovery process. 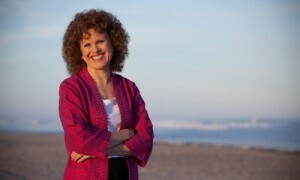 In her book, Legal Abuse Syndrome, Dr. Karin Huffer outlines eight steps to recovery from abuse — and believe me, deception and exploitation by a sociopath qualifies as abuse. Step #3 is obsession. “Figuring out what happened and feeling a basis for feeling safe again preoccupies the victim’s life,” she writes. This is why you are obsessed — your ability to perceive reality is critical to your sense of safety. The sociopath deceived you, so what you thought was reality turned out to be a shimmering mirage. Therefore, your sense of safety was shattered, and you want it back. You want to know what was real and what was fake. So obsession is a normal reaction to your experience — at least you know that you’re not crazy. Still, it’s unhealthy. Why? Because obsession interferes with No Contact. No Contact means you cut the sociopath out of your life. You do not see this person, talk to them, exchange text messages or emails, or visit their Facebook page. When you go No Contact, the fog starts to lift and your mind starts to clear. The goal of No Contact is to get to the point where you don’t even think about the sociopath anymore. Well, if you’re obsessing, you’re thinking about the person, which is a form of being in contact. On the one hand, obsession is normal. On the other hand, it interferes with your recovery. So what do you do? You manage your obsession. Typically that means you set limitations on the time that you will allow yourself to think about the sociopath. Maybe you will permit yourself an hour a day in the beginning, with the goal of reducing the time as you move forward. And what do you do for the remaining hours in the day when you want to obsess? You distract yourself. You find something else to occupy your time and your mind. Maybe you’ll watch movies on Netflix. Maybe you’ll read an entire series of crime thrillers. One Lovefraud reader said that she worked on jigsaw puzzles. Physical activity of any kind is also a good idea. Create a new focus for your attention. If you find yourself drifting off into obsession, pull yourself back and refocus. 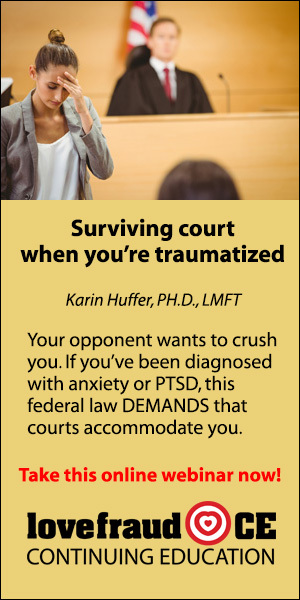 You also might want to consider EFT Tapping. This is a form of acupressure that breaks the connection between a memory and the emotional charge of the memory. 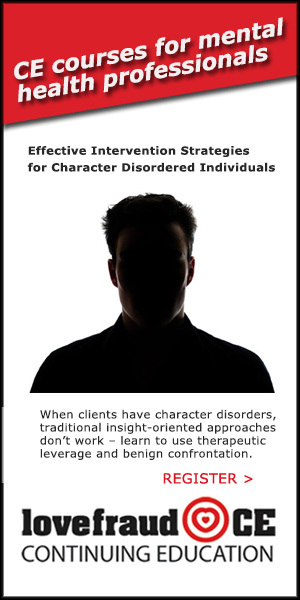 Tapping on your experience with the sociopath will help decondition your brain to the obsessive responses. 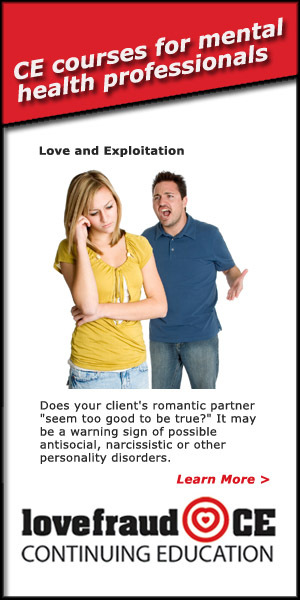 For more information, see Lovefraud’s webinar on EFT Tapping. The bottom line, therefore, is that obsession is a normal phase that you go through after you discover you’ve been betrayed by a sociopath. Instinctively, you are trying to figure out the truth, so that you can recover your sense of safety. But the time comes when obsession interferes with your recovery. By managing the time that you spend obsessing, you can pass through the phase and move on with your life. Nothing helps. I’ve followed this page and others. I’ve tried CBT, therapy, prescriptions, meditation, coloring books, exercise, redirecting thinking, diet changes, healing programs, tapping, books, Netflix marathons,…. Every thought prompts me to question “Was that a lie too?”. Everywhere I go, I see things that prompt me to question, “Was he really there or was he lying? Or was he texting someone else while we were there together?”. I really feel as if I am shattered into a million tiny shards of sharp, cutting glass, that can never be reassembled to ever be functional again and joy and Hope were just an illusion that I will never know. I suffered with debilitating obsessive thinking after I was dumped (for the last time) by my sociopathic ex. I literally laid on the couch and thought, thought, thought every minute I didn’t have to be at work (and a lot of the time there too). I couldn’t think or talk about anything else. I developed horrible stress headaches and neck and shoulder pain. I felt spacey and light headed all the time, and definitely was paralyzed mentally. I had my “favorite” conversations to rehash and while cleaning out the house of his things found new things that needed analyzing. Much later I realized there are no answers to the questions, and even if there were, it wouldn’t change things. I didn’t know about Love Fraud at the time, or any of these techniques, and after months of this, found a book on how to manage obsessive thinking. For me, what worked was physical labor, and by that I mean I dug holes in the back yard and filled them up and sawed tree branches into thin slices. I took walks and counted my steps, because I couldn’t think of anything else while I was counting. I did this for MONTHS and little by little, the obsessive thinking faded. You don’t mention how long it’s been for you, but I can tell you it took me way over a year before the obsessive thinking was completely gone, and that was with constant vigilance on trying to break the cycle. It is a process, and you need to find the technique that works for you and give it time – even a minute of being able to get interested in a tv show or read a magazine article is a triumph and progress. The first time I actually lost myself in something else for a few minutes I was so happy I broke down and cried. In August it will be 7 years since the day he walked out of my life and left me in shambles, and I’ve recovered and then some, but it was a long and slow process and it took single minded focus on getting myself healthy again. Living with a clear mind is pure heaven, and I realized that I hadn’t had a clear mind since the day I met him. I did it, and you can too! HanaleiMoon – thank you so much for sharing your story and your advice. I hope it helps. cantlivewithhim – I am so sorry for what you are enduring. It is so difficult. Was that a lie too? Yes. Was he really there or was he lying? yes, he was lying. Was he texting someone else while we were together? Yes. Perhaps part of the cause of the obsessive thinking is that you are questioning everything. Assume that everything out of his mouth was a lie, and everything he did had an ulterior motive. Maybe it will end the questions. Of course, this means that your entire relationship was a lie. Your goal is to get to the point where you can accept this. That’s hard to do, because it hurts. Hurts a lot. Sometimes we are afraid of the emotional pain. And for this reason, we don’t allow ourselves the feel the pain emotionally — we try to process the experience mentally — hence the obsessive thinking. Understanding what happened on an intellectual level is just the beginning. Real recovery from the experience of being betrayed by a sociopath is emotional. 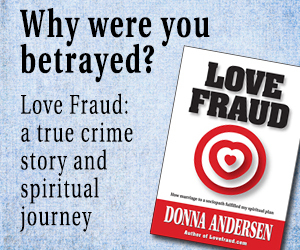 If you can allow yourself to really feel the pain of the betrayal, it may help. If you’re already doing that, then my guess is that there is still more pain inside that is even deeper. Recovery is difficult and requires commitment. 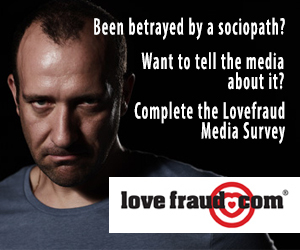 Know that other people here on Lovefraud understand what you are going through. Have faith in yourself. My heart breaks to read about your pain. Please know you are not alone. I’m struggling too. HanaleiMoon offers good advice.I find myself open to all suggestions.What really gets me is realizing how badly he treated me and yet I still miss many parts of the relationship.Why do I do that to myself? Hard to reconcile the bad with the good.I know the pain and obsession ends with time. I wish I could speed up time.Stay busy and know good thoughts are coming your way to heal soon. Million tiny shards is almost exactly how I described it…or surrounded by the tiny bits of my exploded brain. Turns out THAT is exactly where I needed to be after a pattern of abusive relationships and topped off by the one with the “path”…because instead of scooping all the bits up and shoving them back in and soldering on like I usually did, I suddenly realized I had the opportunity to rebuild my brain from scratch. I questioned EVERYTHING before I put it back in my head. I highly recommend David Richo’s “How to be an Adult in Relationships”. Completely helped me understand what a healthy relationship actually was. I purposely rebuilt from scratch and examined every one of those shards…some just needed cleaned off, some needed sanded…some needed to be pitched and replaced! Sadly, everyone of us have gone thru the stage you are going thru now. It’s a nightmare to be with them but also when you first leave. It’s exhausting mentally to deal with their aftermath. I’m so sorry that you are struggling right now with all of your thoughts (aka racing mind). I can only tell you from my own experience that where you are at right now in your recovery feels like it will never end. But, I promise you this, it will. You will get to a point that your mind will settle & you will not even think about him. It does not happen overnight. It takes time. Feel all the emotions that you are feeling…this is part of the (painful) recovery stage. I am with Donna…yes…he did all the things that your mind is now unearthing!! I’m sorry for what he has done to you. Your mind (your conscience & sub conscience) is unearthing everything that he did. He controlled your mind with literally brain washing, mind control, trance, & hypnosis (this is what sociopath do to control people) and he used most likely gas lighting abuse (do a search here at love fraud), reward & punishmetn, pathological lying, manipulation, instead fear & phobia’s etc etc into your mind. So now, your mind, is purging everything all at once…it’s scary to feel all of these thoughts now. When you get to the point of realizing YES, he did everything that I think he did you will be moving to the next stage of healing…coming to terms that EVERYTHING he said & did was a lie & manipulation…if very hard to accept. This does not happen over night. 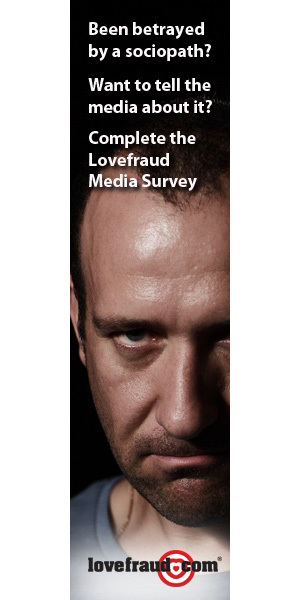 Keep reading everything here at love fraud, watch Donna’s videos up at the top over & over and read her book Lovefraud 10 signs you are dating a sociopath. Also…what people do not realize is when you break up with someone your body releases high levels of cortisol & adrenaline…symptoms of this are racing mind, sleep issues, mood swings, anxiety & depression etc. 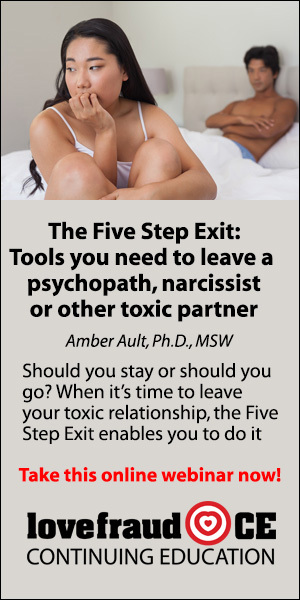 But when in a relationship with a sociopath you are under constant stress daily endlessly…this continual stress causes our adrenal glands (they reguate our blood pressure, blood sugar, cortisol & adrenaline level and regulate over 50 hormones) to work over time and in return they become burnt out and this wreaks havoc on our mind & body. 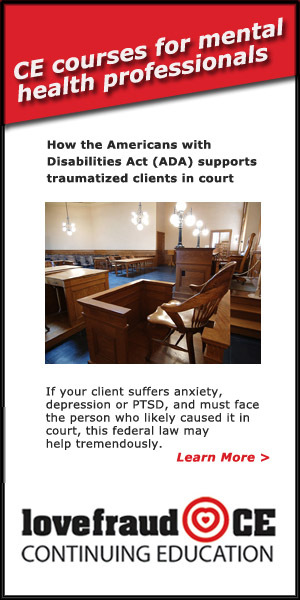 Most victims of sociopaths have PTSD…this sounds like you do = racing mind. I believe from my own experience that the biggest issues with PTSD is adrenal fatigue which MUST be healed. 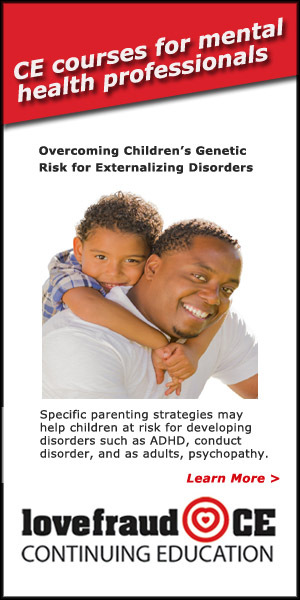 I was lucky enough to have a friend direct me to an Endocrinologist doctor who tested me for cortisol levels, vitamin & mineral deficiency, hormonal imbalance…and because of all the stress my ex (a sociopath) put me under my lab results were horrendous. I was in poor health. I knew this but not to the extent of the lab results. I would highly recommend that you look at Adrenal fatigue and also look at sites like Drlam. com and Adrenal fatigue. org for videos and more info and Look at their SYMPTOMS lIST to see if you have more symptoms. One another site the site creator asked if anyone had health issues from when they were with their narcissist. 400 responded YES!! They listed symptoms the bulk of the symptoms listed from the 400 people were adrenal fatigue. it’s not “all in our minds”…sometimes it’s our body not functioning correctly that is affecting our mind. (ps I have zero affiliation with these two sites except the fact my doctor gave me Dr Wilson’s adrenal fatigue vitamins. Adrenal fatigue and adrenal stress cause a long list of symptoms because they are intertwined with other hormonal imbalances. Insomnia, anxiety, intense irritability, fuzzy thinking and weight gain are some of the common adrenal fatigue symptoms that drive women to find effective relief. They’re tired, tense, stressed out, and may suspect that their symptoms are caused by menopause. But so often, adrenal stress is at the root of their difficult symptoms, even when they are on the cusp of menopause. Adrenal fatigue develops over time in response to chronic stress that produces symptoms the longer it goes on. With adrenal fatigue, even if you think you’re handling stress well, your body is telling you a different story. While all hormones are connected to and affect one another, many experts call the stress hormone cortisol a “major” hormone. As cortisol becomes imbalanced, your body struggles to keep other hormonal functions in balance. This adrenal connection to other hormones helps explain how the effects of stress show up in such a variety of unpleasant ways. Taking care of your adrenal problems first makes it easier to resolve other hormonal imbalance problems — like menopause symptoms. Most women suffering from adrenal fatigue have imbalances related to their stress hormones. Their symptom sets usually fall into one of three categories that can worsen along a spectrum of fatigue: “wired,” “tired and wired,” or “tired.” As adrenal imbalances worsen, women may move through these stages until they reach the point of near exhaustion. Knowing your type of adrenal fatigue determines how you will find relief and restore healthy adrenal function. Your body is creating and responding to a constant flow of stress hormones such that you’re always in active mode and feel “ready to go.” You may be periodically overwhelmed by fatigue, but sleeping feels like a waste of time because you have so much to do. Your adrenals aren’t regulating their hormones well. They don’t produce enough cortisol in the morning, but they produce too much near the end of the day when you should be winding down. You can’t get up in the morning — but you can’t sleep well at night either. Your adrenal glands have been pumping out extra cortisol for so long that they’ve become exhausted. They can’t produce stress hormones in the quantities you need to feel energized or even alert. As a result, you feel completely fatigued, from morning to night. I too was obsessed by my ex, at first I was obsessing every waking hour and nothing could divert my attention. After a few months I started to get stronger so I knew I would be ok. However, more than two years later I was still thinking of him every day so I got very stern with myself and put an elastic band on my wrist and every time I had an obsessive thought I pulled the band hard and let go! Within a couple of weeks I had stopped thinking of him! This is fairly low tech I know but worth a try when you have lingering feelings that just won’t go away! I’ve also had success with eft but for a different relationship problem, however I was amazed at the results I achieved. I can recommend giving it a go as it’s quick to learn and the results are fairly fast. I’m so glad its NOT me; I went through this..I was obsessed with him, while we were together..and after divorce..it went on and on and on. No matter what I did or tried not to do; he was front and center in my mind, memories, flashbacks..why did he do this, why did he say that, why didn’t I leave sooner, why didn’t I listen to others..on and on and on. Like this article says; I had to keep my mind occupied and my body too tired to NOT obsess. It took a long time..and finding websites like LoveFraud and a sizable stack of books/articles on psychopaths to understand and detach. Its been a long hard road. I cant afford therapy, but the books/articles/websites have helped me. I am replacing my obsession(s) with finding ME..I almost was completely lost. I recently found another website Verbal Abuse Journels..by chance while browsing for something else. I recommend it. I am a lot stronger now. I stay active, that helps. If you’re too tired, you rest. Books,puzzles, mowing a large yard (without a riding lanwmover, working out, long walks, church on Sundays, being with friends. Anything that occupies your body, your mind..and NOT HIM. I’ve spent so long reading about the psychology of narc/ spath abusers I could have earned a degree in Psychology in 6 months.